Video interviews with the presenters can be found here. 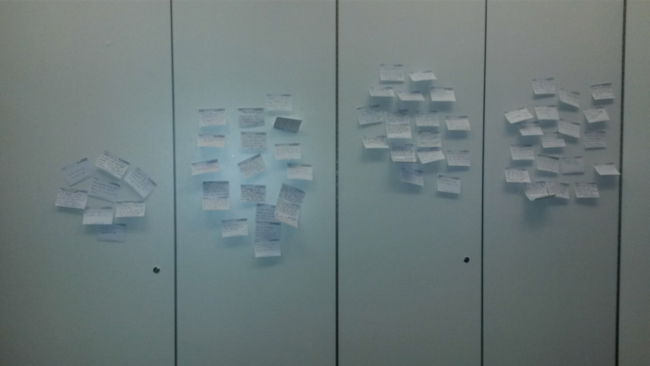 Throughout the seminar delegates were encouraged to write their thoughts, questions and general feedback on post-it notes, which were displayed on the wall. Is there only one right way to communicate? Future suggestions / questions to be addressed. 1. Is there only one right way to communicate? Similarities and differences between online and face-to-face communication were raised, alongside a debate about whether face-to-face communication should always be encouraged over online methods. Using technology in collaboration (together with parents, classmates etc. ), and as a tool to help /aid social communication was highlighted. The role and the limitations of technology were also discussed. Technology needs to be appropriately tailored to meet the specific individual needs of the user. A crucial question is how to identify these needs. This theme focussed on two key questions. Firstly, can we aim for generalisation? 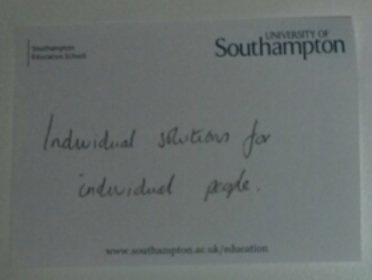 And secondly, is this an essential and realistic goal? A number of comments highlighted the importance of social networks in supporting and teaching social interaction skills. Issues around disseminating the potential of new technologies and dispelling a general notion that ‘technology is bad for our children’s health’ were highlighted. A number for future research directions were suggested by participants and questions were raised regarding the role of technology for ASD population. 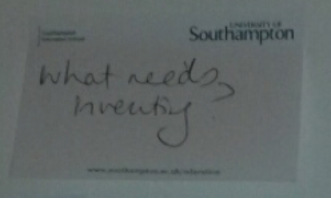 Also, some interesting suggestions for the future seminars were collected from these post-its. The first in a new and exciting Economic and Social Research Council (ESRC) funded series exploring key themes surrounding the use and development of innovative technologies for people on the autism spectrum. 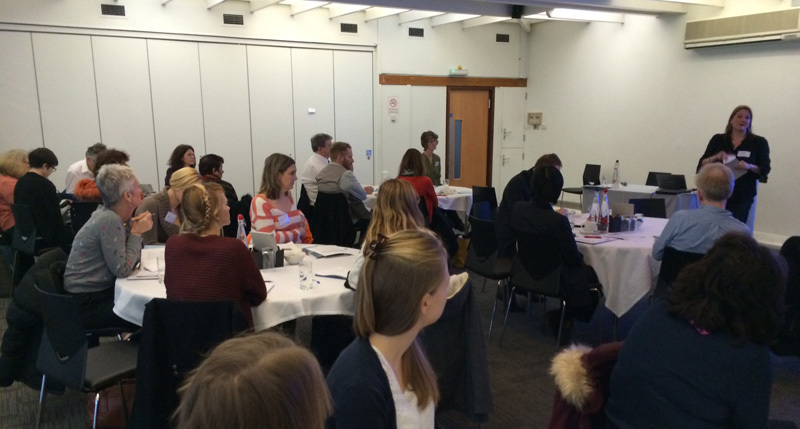 This was the first of seven events, and was introduced by Prof Sarah Parsons. Sarah provided some details for the day, which focused on exploring the ‘social bubble’; that is, whether technologies create a social bubble and, if so, do they increase social isolation, or provide helpful ways of engaging with other people in a remote way? Sarah emphasised the importance of the ESRC series in sharing ideas and practice amongst academics, practitioners, parents and families, and people on the autism spectrum. 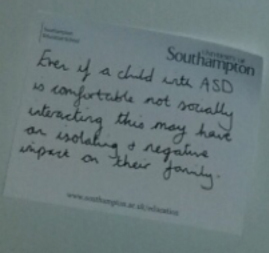 For example, what does research in this field mean to people on the spectrum and people who support them in schools? The seminar series will involve a variety of ‘bubbles’ including (and in order): social, developmental, methodological, technology, disciplinary, diversity. This will span the period of 24 months with seminars every 4 months (split between the Universities of Southampton, Sussex and Bath). The day included talks, sessions and discussions presented by leaders in the field of autism and technology. 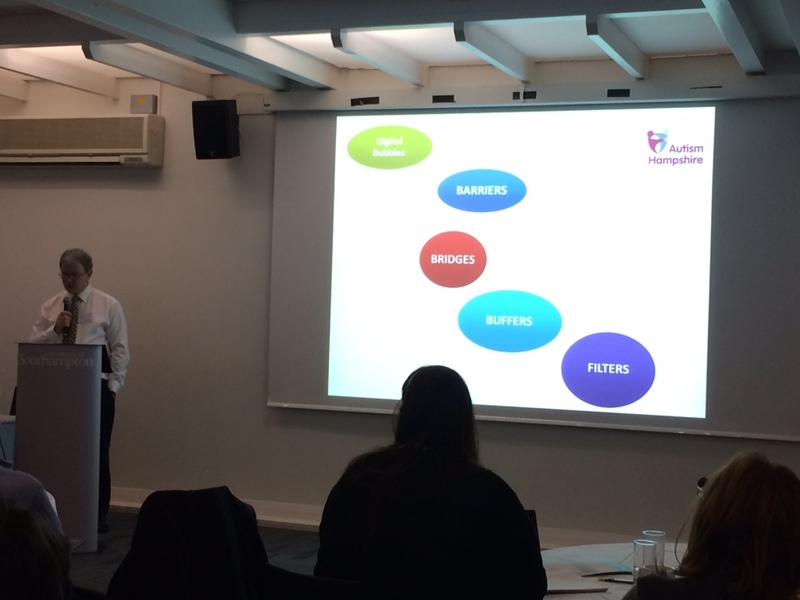 The first talk, and helping to set the tone for the day, was by Andrew Monaghan (CEO of Autism Hampshire) who discussed the role of his organisation in local and national contexts. He then discussed the area of technology and autism posing a question: does this present a challenge or opportunity? He explored this through case studies. This included an experience of a young man becoming obsessed with technology and using computers for long periods of time (in one case 12 hours at a time). It is important to remember some possible aspects of technology use that we need to be mindful about. Andrew handed over to Barnabear for the second part of the talk, who provided some insights about the benefits of technologies from the perspective of someone with Asperger Syndrome. Barnabear discussed how technology could be a: a barrier, bridge, buffer or filter for people with an autism condition. He discussed these in turn and provided stories to illustrate each. These included the advantages, challenges and affordances of technology. 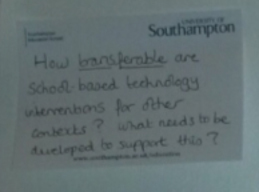 One of these was about ‘control’ and how technology can help provide increased control of environments and spaces. One example was the use and role of Internet blogs and ‘chat’ rooms. Talk About Autism was one example he discussed. This was a very thought provoking talk and one that others throughout the day referred to. Barnabear’s messages were that, as designers, user interfaces should be simple (the simpler the better). Interfaces should also be responsive. In addition, he discussed the notion of how technology and online contexts can enable self-paced learning and provide a buffer to enable learners with autism to be successful. 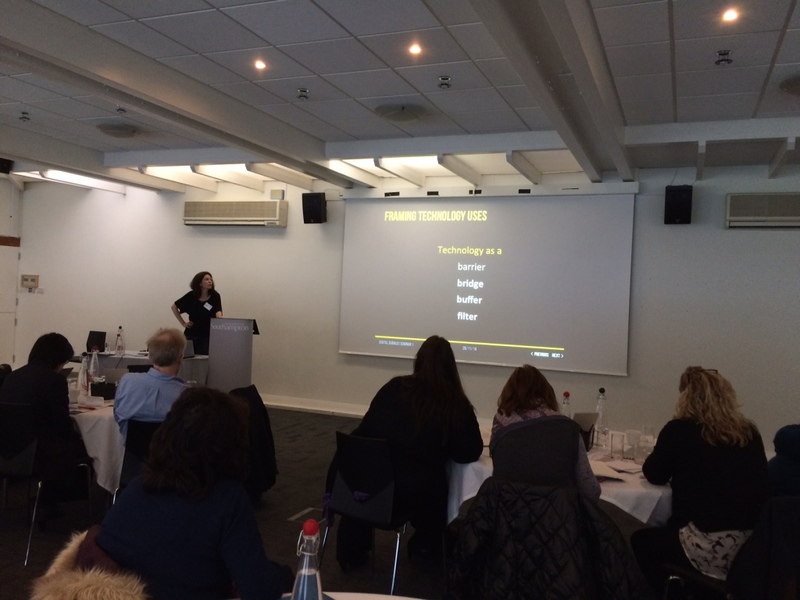 The next speaker, Dr Nicola Yuill, presented her work on ‘Collaborative Technology for Face-to-Face Social Interaction’. She began her talk by highlighting two common stereotypes about autism and technology; a) technology isolates; b) people with autism love technology. She spoke of the research that she and her team have been working on at the Children and Technology Lab (Chat Lab, University of Sussex). This work focuses on designing technology to support collaboration, rather than using technology in isolation – a message that was emphasised throughout the talk. Nicola highlighted the importance of collaboration, particularly in terms of supporting general social development. This is an area that children with ASD often find more difficult compared to their typically developing peers. Developing methods to enhance this skill is therefore extremely important and Nicola spoke of a number of ways technology can be used to both support and help develop such skills. She described the skills required and used during collaborative tasks as 1) co-ordinated awareness of others; 2) co-ordinated control of action; 3) sharing information, sharing results from a number of studies that demonstrated that technology could be used to encourage and support such skills. A particularly interesting point she made in terms of the use of technology in schools was that although resources may now allow for each child to have access to their own computer/i-pad, it may actually be better to encourage children to share in order to encourage joint attention and better collaboration. Following on from this, Prof Kevin Durkin explored how children’s characteristics and needs influence how they use digital bubbles, specifically videogames. Kevin gave an informative and entertaining talk about what digital bubbles are, how they are used and how they are viewed. He defined digital media as something that has been created, modified and distributed via computers, and that digital bubbles represent different forms of engagement with new technologies. Specifically, he asked: are digital bubbles isolating children from reality, or are the critics of digital bubbles isolated from reality? In a review of popular discourse and current research, Kevin added that what might look playful in children’s use of computers might carry real benefits, though he acknowledged a Digital Bubbles Panic propagated by media coverage and prominent commentators. Kevin countered that digital bubbles are just another way of playing and cited several studies that undermined the idea that Digital Bubbles are something to panic about. These studies reminded us that play is a good thing, and that important things happen when children play, whether in the real or digital world. Kevin concluded by stressing the importance of the interplay between digital bubbles and the need for social reality, suggesting that neither is mutually exclusive but comprise what can be seen as a harmonious relationship. So, digital bubbles are unstoppable! 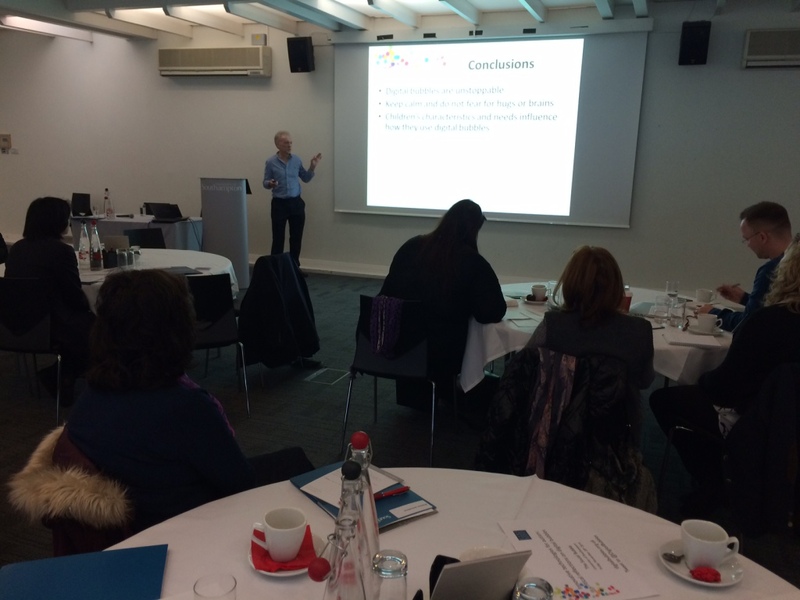 Moving to social media, Prof Mark Brosnan presented some initial findings from a study examining the role and use of Facebook by users on the autism spectrum. Mark talked about the role of online communication and a study he was involved with trying to find out more about how people with autism use social media to communicate. In part this was about using social media (computer-mediated communication or CMC) to help overcome social difficulties experienced by people on the spectrum. He asked: can communication barriers be overcome using digital technology? Mark firstly provided some context and background information, explaining how and why people with autism can sometimes prefer to communicate digitally (or online). Here he suggested (backed up by research) that CMC was a way to slow down the communication process and this was helpful to some people on the spectrum, in addition to reducing the need for face-to-face communication. These aspects can help to enhance predictability and control for users on the autism spectrum. 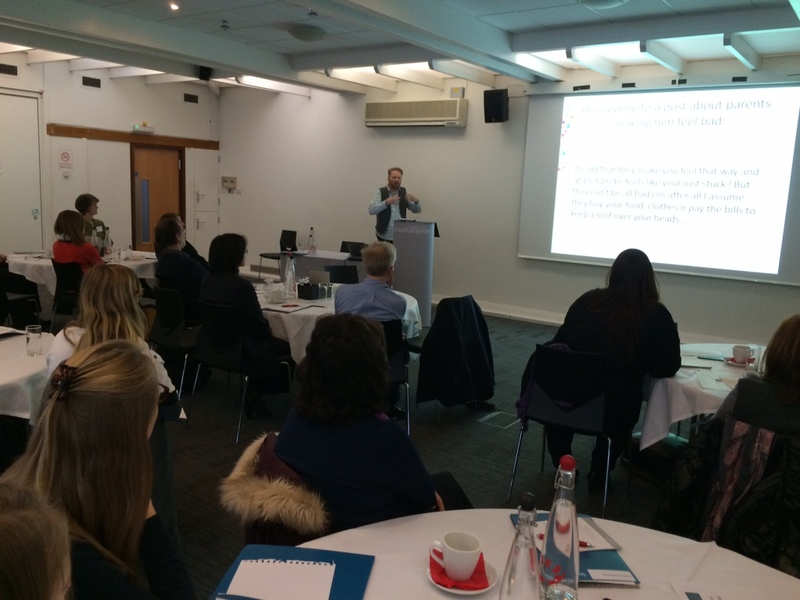 Mark then gave some background to a project that investigated the use of social media by people with autism. His research found that participants with autism demonstrated emotion and empathy in online contexts in a similar way to people without autism. In addition, some initial findings suggest that Internet communication may be experienced as “easier” than face-to-face communication for some people with autism. The views of participants in the study suggested this was due to reduced pressure of reading social cues and control of timing (having more time to respond in communication exchange). It seems from analysing the online communication of people with autism, social media can provide greater control over interactions and this control means that people may be more willing to communicate and to broaden their social groups; albeit in an online context. Questions raised by this work include: is online communication (and the benefits afforded) generalisable — and does this matter? Should we (as researchers/practitioners) be encouraging online communication for people with autism? This certainly provided some lively discussion at the tables. Finally Dr Judith Good discussed the role of generalising skills from the virtual to the real world. Usually the ‘real’ world, ‘virtual’ world, and the ‘digital’ world are seen as being distinct, with the value (in research terms) being to use technologies to support skills and understanding in the real world. Judith argued that this distinction between the ‘real’ and ‘digital’ worlds may be too simplistic, and also outdated, and consequently we need to reconsider it. Secondly, she highlighted that it is important to create a shift in the perspective from the ‘closed technological environment in which we look for transfer’ to the ‘integrated technologies’ that are now very much a part of the ‘real’ world. “We can make technology a bubble if we continue with the antiquated view that it exists in a separate ‘digital world’… Or we can look at how to maximise opportunities for growth, interaction, learning and play in our ‘real (digital) world’”. This presentation sparked interesting discussions about the new perspective of designing integrated technologies. Looking forward to the next seminar, Prof Sarah Parsons concluded the day and discussions, suggesting that some of the key themes from today were about the contexts in which we see and use technology for users with autism, and the way that these can be designed and used to have the greatest impact for individuals.